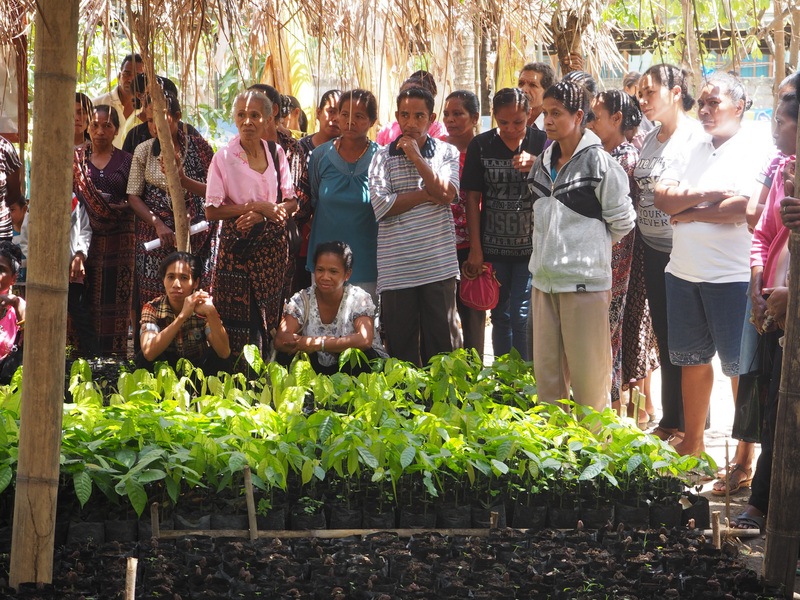 This year we are hoping to hold a Cocoa Field day in Flores during November. Field days are critical, as they allow the NTA to showcase the best farming demonstration plots. NTA experts are present to explain the success of the plots and educate community members on the best varieties, as well as demonstrating optimal techniques to prepare beds, plant and maintain trees and harvest the crops. Cocoa generally grows on the steep slopes of Flores where little else can be grown commercially. As a result of this, it is a vital source of income for thousands of families within the area. Many of the plantations were established over 50 years ago and are now well past their prime productivity. New cocoa trees take 5 years to produce fruit and many farmers are reluctant to revitalise the plantations. However, declining yields as original trees exceed their productive life pose a serious threat to income generation and food security for these families. The NTA has taken a long-term stand to help communities through the process of transitioning the older plantations to the modern era. NTA helps farmers to progressively improve plantations by cutting out older trees and replace them with new higher yielding cocoa varieties. Farmers are also trained by NTA experts in the best techniques for composting, terracing and optimal pruning.This year we hope to raise enough to run the field day, which will include the provision of the best available experts to cover all fields of interest. Good community consultation is vital to NTA’s approach of providing successful low-cost outcomes. NTA has successfully implemented programs in eastern Indonesia for over 25 years. NTA’s ability to invest in specific and targeted outcomes is due to a continuing strong emphasis upon high levels of local participation in decision-making and implementation. This is ensured through effective and ongoing communication with community representatives and families. Through careful and meaningful engagement and collaboration, the NTA ensures investments are robust, cost effective, meaningful and enduring. This proven approach will continue to be NTA’s formula for success along with extremely low operational overheads. To receive NTA support it is compulsory for the farmers to form community groups (usually 10-15 families) that must plan and work together. NTA stays with these groups over many years and assists them to progressively improve their farming and community development skills and provide support for improved agriculture and infrastructure. They must decide on their own priorities and future support is dependent upon them demonstrating that they have successfully implemented the previous project. This encourages ownership and maximizes focus on activities that will have the maximum benefit. 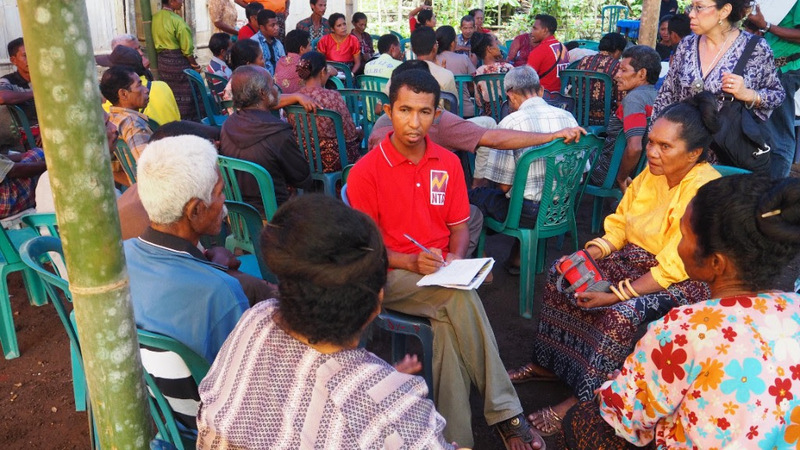 Contributions to the NTA provide vital support for our peak level meetings for community groups in Flores and West Timor. Above: Pak Mathias talks to local community members about their plans and how to work together effectively to achieve the best outcomes. As the financial year draws to a close, there is no better time to support this work through a tax-deductible contribution. Each and every contribution is critical in making a difference to the lives of our neighbours in East Indonesia. As always, we thank you for your continued and generous support.